Home / Savings Blog Posts / Recipes / Easy Dessert Recipes / Rainbow Fudge Recipe! 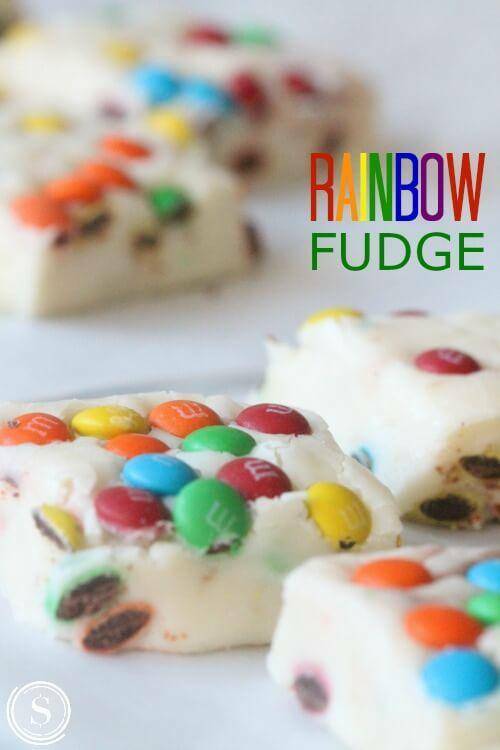 Here is a Rainbow Fudge Recipe for Rainbow Birthday Parties or St. Patrick’s Day! I grew up eating a lot of fudge from a fudge factory, and I have to say, This Rainbow Fudge Recipe rivals the stuff that you buy at fudge boutiques! You will leap for joy over this simple recipe! Plus, you will impress all of your family and friends with your fudge making skills! This is the perfect Plus, be sure to check out even more Rainbow Recipes at St. Patrick’s Day Crafts and Recipes! Place the White Almond Bark or Chocolate in a Bowl and Cover with the Sweetened Condensed Milk. Melt the Chocolate and Milk in the Microwave according to the directions on the back of the Chocolate. Normally melt 30 seconds at a time stirring in between until creamy. Once Melted add in Vanilla and Stir. Allow to cool slightly until almost room temperature. Slowly mix in M&Ms (Do not over stir or the colors will run, this is also the reason you let it cool). Place Fudge Mixture into an 8″x8″ Baking Pan lined with Parchment Paper and Chill for 2 hours or until firm. Store Fudge in the Fridge until serving. You can wrap these up in cute packages for your kids to take with them to school, or you can take these to work with you! If you are planning a rainbow themed party then these would be a great recipe to put on the dessert list! Also, be sure to check out this Rainbow Cupcake Pops Recipe! This is an awesome dessert recipe for your St. Patrick’s Day Party! You can make these as a center piece or for a snack! Your guests will leap over the rainbow for this fun cake pops recipe!